Our kitchen is run directly by the owner and by highly specialized staff and offers dishes with simple and genuine ingredients, which will make you taste the delights of Mediterranean cuisine. 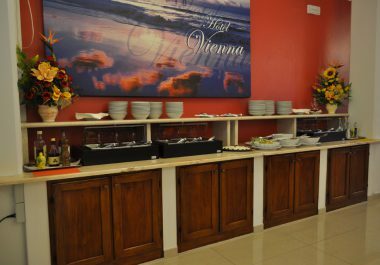 All our guests can enjoy an excellent rich breakfast buffet, open from 8am to 11am, and the dinner, which is also buffet-style with every day fresh and different dishes. 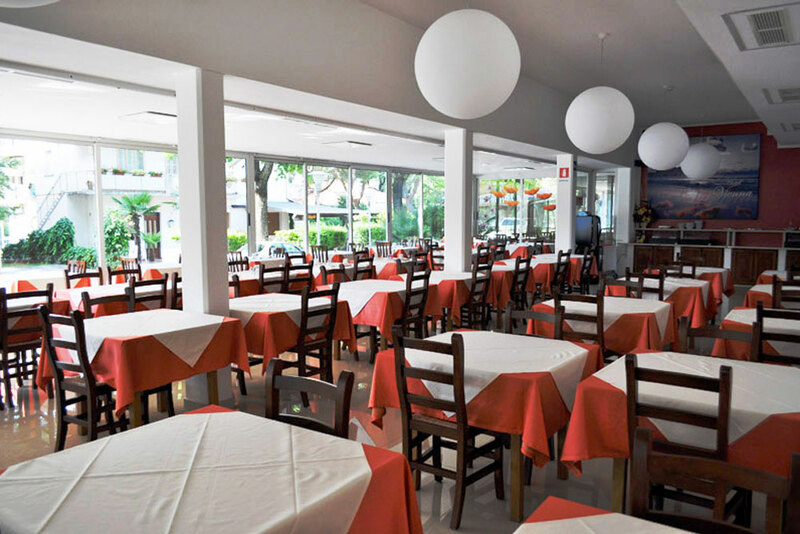 As for lunch, you can take advantage of the agreement with the kiosk Portofino Beach Bar at the beach office 15 in Lignano Sabbiadoro, easily reachable with a walk. For our guests, is reserved an ad hoc fixed price menu to taste on the kiosk terrace directly on the beach between a swim in the sea and a nap under the beach umbrella. 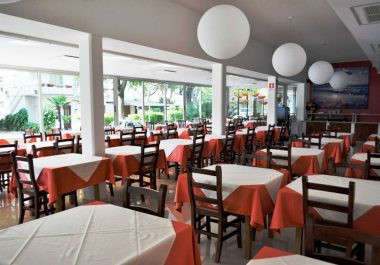 In addition, at 100 meters from the hotel, there is the restaurant-pizzeria Arco, also open for lunch. 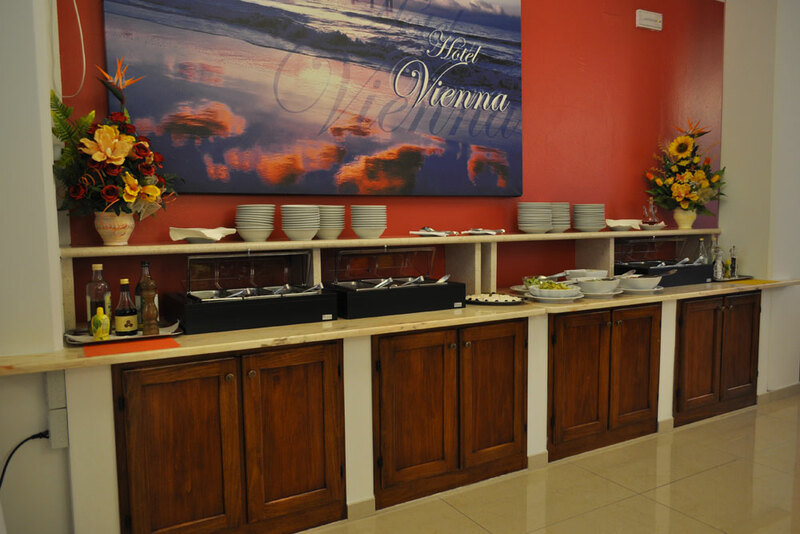 At the Hotel Vienna we are attentive to your particular needs, such as, for example, food intolerance and requests for vegetarian menus. Report it on your arrival in hotel, we will do our best to satisfy you and to offer you a menu that suits your requests. All our guests must be able to spend a pleasant and carefree holiday in Lignano. For this reason we have tailored receipts and dishes suitable for those who are allergic or intolerant to gluten, lactose or other, or must follow a particular diet. For this reason we ask you to let us know at the time of the booking or on arrival at the reception, if you have food allergies or intolerance. We will advise the chef, the kitchen and dining room staff to offer you comfortable holidays and make you feel pampered in every way. In addition to eat good, you will also drink good. You can accompany your dinner at the Hotel Vienna with the house wine, produced in the nearby of Lignano Sabbiadoro, or with one of the numerous renowned red and white wines of the Friuli hills area. Fresh and light white and red wines, or more full-bodied to accompany good meat dishes, without forgetting the Prosecco, right choice to start the dinner. At the Hotel Vienna you will have the possibility to choose from a good number of local wines and wines offered by Friuli Venezia Giulia. Ask our dining room staff the wine list and let you recommend the best combination to enjoy a very good dinner during your beach holidays. The buffet dinner of the Hotel Vienna will leave you speechless. You will find every evening different dishes that are inspired by the local and mediterranean tradition, prepared by our chef and his brigade with quality, simple and natural products. You can choose between different types of appetizers, unique light dishes, different meat, fish or vegetables first courses and meat and fish second courses. You will be spoiled for choice among fresh, cooked and battered vegetables. The final touch are our desserts: cakes, puddings and everything your palate desires. Really impossible to resist! Throughout the dinner the dining room staff will be always present, available to order drinks and for any information and request. Breakfast at the Hotel Vienna is top! Healthy and nourishing, it is the ideal to start at the best the holiday. The counter in our dining room offers a rich choice of fresh and genuine products, that you can enjoy both in the dining room and on our veranda from 8am to 11am. Every morning you can start with a sweet breakfast with homemade cakes, tarts and plum cakes, brioches, bread of different types and marmalades; if you prefer an energy breakfast enjoy mixed cold cuts, eggs, bacon, omelettes and mixed vegetables; for a light and nutritions breakfast choose fruit, yogurt, cereals, juices and smoothies. From 9:30am you also find a glass of prosecco, to make you feel the relax of a holiday in Lignano since the morning. We are ready to offer an excellent breakfast even to those who suffer of food allergies or intolerances.